The Guilford Press, 9780898623437, 634pp. "This valuable book superbly covers the recent explosion of theories and models of hypnosis. All students and researchers interested in this fascinating topic must read it because, henceforth, serious discussion of the nature of hypnosis will begin here.'' --T. X. Barber, Ph.D.
"A first-rate collection of the modern theories of how hypnosis is currently understood. Outstanding chapters from many of the best scientific and clinical theoreticians from around the world attempt to describe a phenomenon that has no universal common understanding. The reader who strives for his or her own understanding of how the mind works in the context of subtle yet powerful human interactions will find this book an indispensable resource for study and reflection. The scientist and clinician will find this book so up to date that the future of the field will seem to tumble from its pages. I thoroughly recommend it.'' --Peter B. Bloom, M.D. "A thoughtful, vigorous, well-written, and serious examination of the intellectual state of hypnosis....It is a compilation of the recent thinking of many leading investigators and clinicians in the field. While we do not yet have an underlying theory of hypnosis, Theories of Hypnosis, in its very scope and scholarly tone, shows us why the field is mobilizing increasing amounts of intelligent attention.'' --David Speigel, M.D. "The most comprehensive discussion of theories of hypnosis available....A significant contribution." 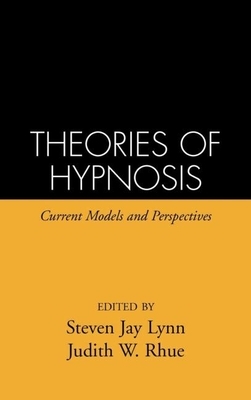 "This book is an important landmark in the history of hypnosis in that it brings together virtually all the leading theorists to present their views on the nature of this most fascinating phenomenon....it undoubtably provides a comprehensive picture of the present 'state of the art'...and is likely to become an important reference text on hypnosis theory for the next 20 years, at least." "Only, perhaps, once in a decade is there published a work on hypnosis so comprehensive and so useful to the students of hypnosis and his or her instructor. For all students, instructors, and others seriously interested in the theoretical problems of hypnosis, it will be essential reading and a highly desirable addition to the bookshelf." "It should be on the book shelf of every member of APA's Division 30, the American Society of Clinical Hypnosis, and the Society for Clinical and Experimental Hypnosis."